One of my favorite things in all the world is having fresh flowers in my home. Oh, I love fresh flowers. Sometimes I'm blessed to have fresh flowers from the grocery store, and sometimes I'm blessed to have fresh flowers from my own yard. But what about times like now, when I have no flowers blooming in my garden and no room in my grocery budget for flowers? Well, inspired by Karianne from Thistlewood Farms, I've come up with a free solution. Boxwood clippings, meet my living room. Don't they add a lovely, fresh touch to the room? For this spot, I wanted a fairly tall arrangement, so I cut long stems and arranged them in a vase. For other spots, I will probably place short stems in a shallow pot or other container. These clippings stay fresh and beautiful for a long time. And when they do start to wither, I have a great source for more free clippings--right outside my front door! By the way, these photos give you a sneak peek of my new living room. I'll be sharing the entire space with you as soon as it's complete. I thought it would be done long before now, but we've run into a snag in getting the right rug for the space. Patience, patience. Guess what's in the other wingback chair? Yep. 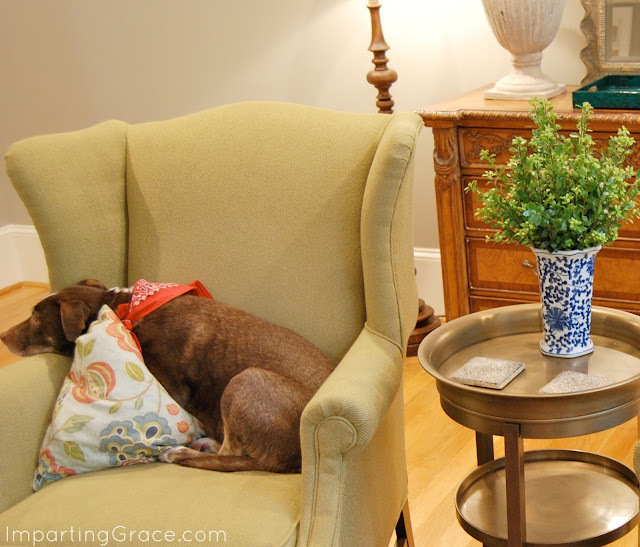 Cocoa has a new favorite spot to sleep. Well, sometimes she sleeps. Sometimes she just hangs out with the family and watches TV. Bonus: greenery looks good for a long time. These clippings stayed fresh inside for two weeks! Follow this simple tip to make all your fresh flowers last longer. Are you a flower fanatic like I am? What's your favorite way to add freshness to your home? This is a great idea. I try to have fresh flowers around my house all the time. It adds life in the winter, and beauty all year round. I have found the $4 bouquets at Aldi to fit perfectly in my budget-if I have no fresh flowers of my own. And they generally last over a week too. Steal of a deal! I have been using greenery lately when my garden isn't as full of flowers. Our old dog looks a lot like yours. She sits just like Cocoa in my husband's leather chair. I think it is the most comfortable place for her with her old (14 years) bones. Been soooooooooooooo busy, but back to blogging and seeing what everyone else is up to! We just moved 1 1/2 weeks ago into our old home, and there are actually six huge boxwoods (in need of trimming) in our yard. Thank you thank you for the idea! The arrangement actually looks very Ballard Designs-ish! We also have 3 hydrangea bushes that are now blooming in shades of greens, blues, and pinks... I'm thinking I need to unpack my vases--they are somewhere. Sigh. Hi Richella! I love to have fresh flowers too. My favorites are spider mums from our local grocery store. It just brightens up any space. 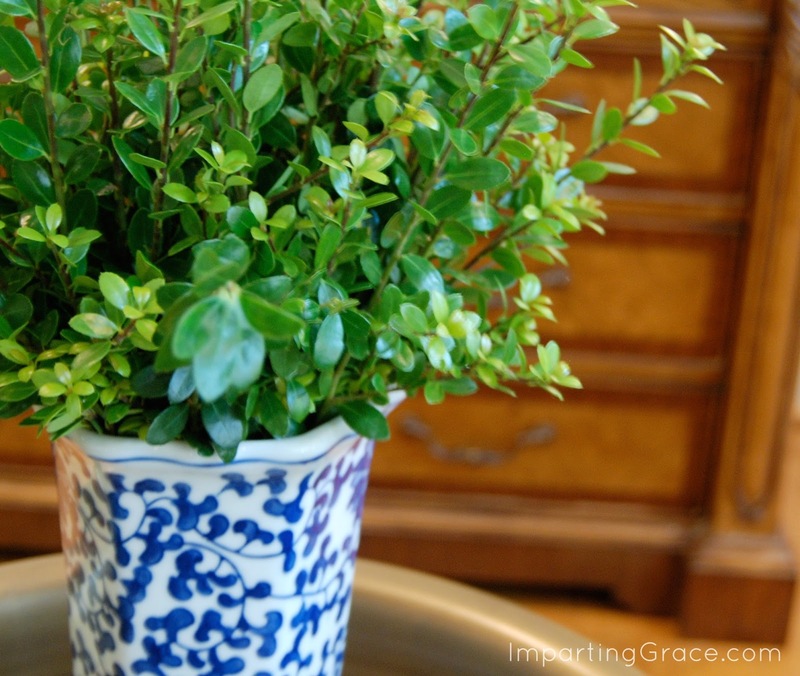 I have several boxwoods in my backyard, so I'll have to snip a few and bring them inside. It's good to know they last a long time too. Thanks for the tip! Loved seeing your little Cocoa! 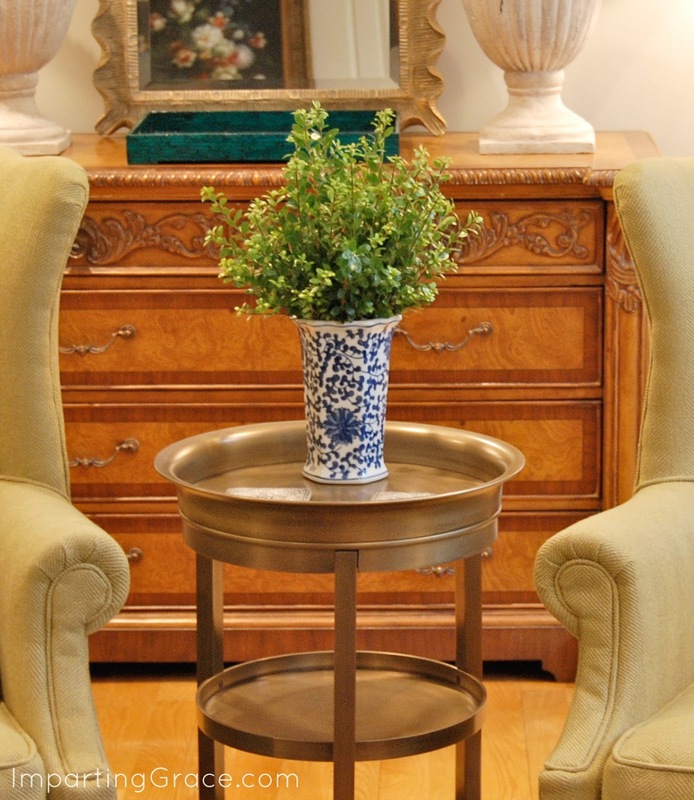 Love the boxwood choice...I love the vibrant green... I actually have a chalk paint from Ms Mustard seed called boxwood green. I have not used it yet. looking for the right piece.... Your living area looks gorgeous. Blessings! so pretty!!! and just giggling about that grocery budget... with the boys being home for summer i am sure you have to spend it ALL on food!!! 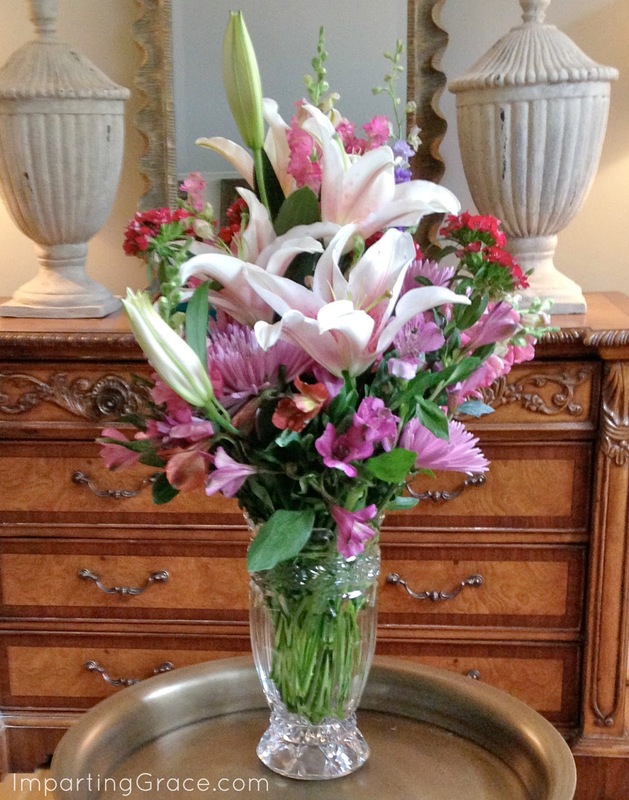 Yes, I LOVE fresh flowers! I have several Gardenia bushes that I love to clip and keep in my kitchen. Hydrangea clippings last about two weeks and the colors are so vibrant in my den! When I don't have anything blooming, I buy fresh flowers from Costco. They are so reasonably priced, I don't feel too bad about purchasing them! Your living room is looking wonderful. Just beautiful! 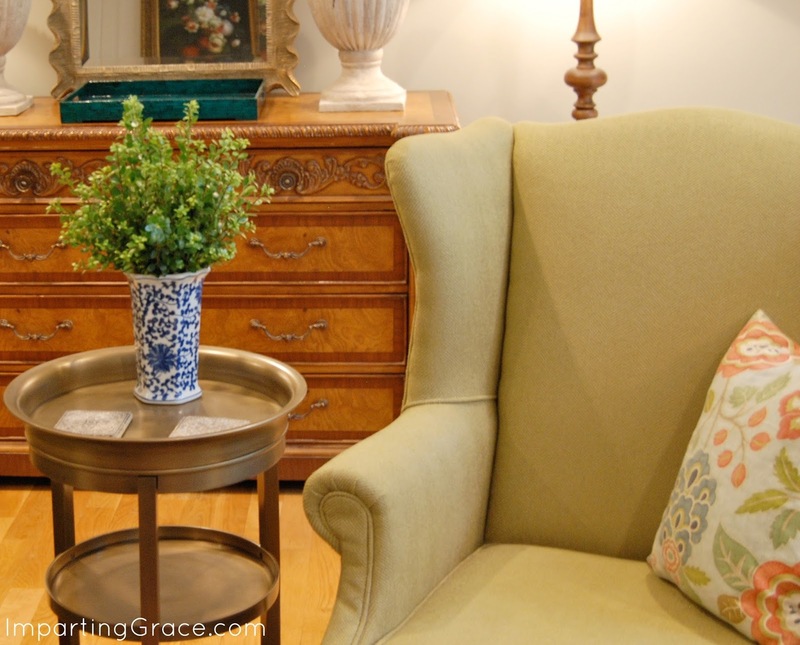 Sometimes a little pop of green is all a room needs. Thanks for sharing the idea! Being a lover of all things live but can't afford fresh flowers regularly, I buy flowers at our local WM that are on sale when they are droopy! 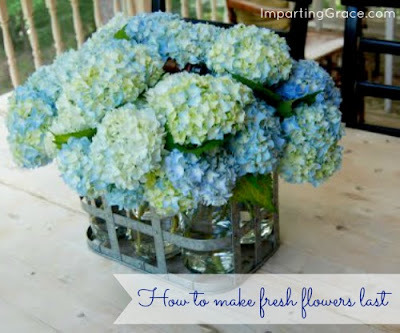 There are certain flowers you can make live a few more days with a little TLC! I just threw out my poinsettia from Christmas a week or so ago. I had nursed it along for as long as I could! It died a natural death!! The deers eat my day lilies but they don't eat my boxwoods! Thanks for the idea!! This time of year, hydrangeas fill my vases. I made sure I had those in the landscaping budget when we built our house. In the winter, I like to use rosemary bush and/or Camellia bush clippings for a freebie. I love your idea of using greenery - so fresh looking. Happy Belated Anniversary! I have a good friend who regularly creates the original "green" arrangements--she just picks different types of greenery and arranges it in a vase. It's always different, and always beautiful. And it's evergreen -- suitable and available year round.